MCLEAN, Va., Sept. 25, 2018 /PRNewswire/ -- Iridium Communications Inc. (NASDAQ:IRDM) announced today that it has been selected as the preferred provider of satellite communications services for The Ocean Cleanup , the non-profit organization deploying advanced technologies to rid the world's oceans of plastic. The Ocean Cleanup is embarking on one of the largest environmental initiatives of this generation by cleaning up ocean plastic debris, starting with what's known as the Great Pacific Garbage Patch. The Ocean Cleanup has chosen Iridium L-band satellite broadband services to support this important mission. The service is being delivered in partnership with Iridium service provider The AST Group. By creating a system of 600-meter-long floating plastic collectors (floating screens, or systems) that include a 3-meter-deep skirt, The Ocean Cleanup collects plastic pollution through a combination of the wind, waves, natural ocean currents and the floating screen's ability to prevent plastic escaping underneath it, or flowing over the top, while avoiding to ensnare sea life. Each system is equipped with two Iridium broadband terminals, and upon full deployment of a fleet of 60 floating screens, there will be 120 Iridium broadband terminals operating as part of this project. The Iridium terminals will be relaying critical systems data including compartment flood detection, position and location information, pictures, 360 degree video and system performance information. "The opportunity to play a role in such an important and historic endeavor was a no-brainer for Iridium. It's an honor for us to be a part of The Ocean Cleanup's incredible mission to rid the oceans of plastics," said Iridium CEO Matt Desch. "A reliable, predictable and redundant communication network, that can work despite adverse weather conditions is critically important to this system, and that's when the Iridium network really shines. 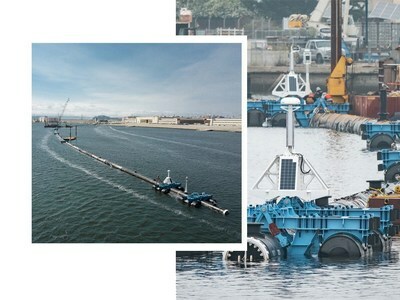 When the oceans aren't cooperating and several foot waves and powerful winds are causing havoc, the Iridium system will help make sure The Ocean Cleanup understands the operational status of each floating screen in the fleet." The Iridium broadband terminals will receive data from a complex combination of sensors and data gathering equipment hosted by each system. That information will then be relayed to The Ocean Cleanup's headquarters in Rotterdam in real-time. Iridium's unique constellation of 66 interconnected low-earth orbit (LEO) satellites requires no local ground infrastructure and provides the robustness, reliability and redundancy needed to ensure this critical data is delivered as expected. Iridium is nearing complete deployment of its next-generation satellite constellation, Iridium NEXT. The new constellation is completely replacing the previous network of 66 interconnected satellites. To date, there have been seven successful Iridium NEXT launches completed by SpaceX, deploying 65 new satellites. One launch remains before completion of the company's historic constellation refresh. In total, 75 new satellites are being launched to LEO, of which 66 will be in the active constellation, with nine on-orbit spares. Statements in this press release that are not purely historical facts may constitute forward-looking statements as defined in the Private Securities Litigation Reform Act of 1995. The Company has based these statements on its current expectations and the information currently available to us. Forward-looking statements in this presentation include statements regarding the deployment and capabilities of the Iridium NEXT constellation and products and services to be offered over the constellation. Forward-looking statements can be identified by the words "anticipates," "may," "can," "believes," "expects," "projects," "intends," "likely," "will," "to be" and other expressions that are predictions or indicate future events, trends or prospects. These forward-looking statements involve known and unknown risks, uncertainties and other factors that may cause the actual results, performance or achievements of Iridium to differ materially from any future results, performance or achievements expressed or implied by such forward-looking statements. These risks and uncertainties include, but are not limited to, uncertainties regarding potential delays in the Iridium NEXT deployment, the development and functionality of Iridium NEXT and related products and services, and the company's ability to maintain the health, capacity and content of its satellite constellation, as well as general industry and economic conditions, and competitive, legal, governmental and technological factors. Other factors that could cause actual results to differ materially from those indicated by the forward-looking statements include those factors listed under the caption "Risk Factors" in the Company's Form 10-K for the year ended December 31, 2017, filed with the Securities and Exchange Commission (the "SEC") on February 22, 2018, and in the Company's Form 10-Q for the quarter ended June 30, 2018, filed with the SEC on July 31, 2018, as well as other filings Iridium makes with the SEC from time to time. There is no assurance that Iridium's expectations will be realized. If one or more of these risks or uncertainties materialize, or if Iridium's underlying assumptions prove incorrect, actual results may vary materially from those expected, estimated or projected. Iridium's forward-looking statements speak only as of the date of this press release, and Iridium undertakes no obligation to update forward-looking statements.